B40, 4-string bass guitar from Carvin. These basses are said to combine many of the new features of the SB basses with the classic styling of the B4 and B5 basses. New features include a new locking bridge, new cutaway neck heel and inline passive controls. Additionally, both models come standard with Carvin's new J99A Alnico V single coil pickups. The Alnico V magnets allow the J99A pickups are designed to produce "tremendous tone, with a full bottom end, clear upper range and just the right amount of mid-range growl." There are hundreds of available options on these new models, Carvin says, including premium woods, finishes, inlays and electronics options, as well as Carvin's new 18V active electronics designed to add more tonal variety to the new Alnico J99A pickups. You can build your new B40 or B50 bass to your exact specifications suited to your playing style and personal tastes, the company says. 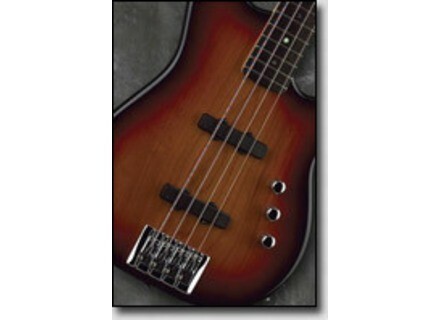 More info: B40 4-String Bass, B50 5-String Bass. Arnoud Faber PaddleBass Dutch luthier Arnoud Faber, has started building a newly designed bass in series, described as a 'pragmatic bass guitar with very distinctive looks, sound and playability'. New Gadow Guitars Basses Gadow Guitars has announced the re-introduction of their Bass guitars. EBS MetalDrive Bass Pedal The EBS MetalDrive pedal was created to satisfy those who look for a heavy distorted bass sounds without any lack of low-end, according to EBS.